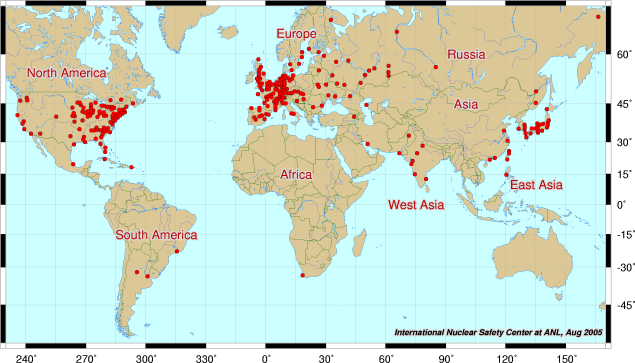 The map shows the worldwide distribution of nuclear power plants. Thirty-five years after Iran, under Shah Mohammad Reza Pahlavi, had begun constructing the light-water reactor in the southern Iranian city of Bushehr with the help of the German Kraftwerk Union AG, a joint venture of Siemens and AEG Telefunken, fuel rods have been inserted today in the reactor, which had been finished by Russia. It’s a great day for the Iranians. The West should consider Bushehr’s nuclear power plant as a confidence-building measure that Iran doesn’t seek nuclear weapons but wants to use nuclear energy for peaceful purposes. Last update August 21, 2010. This entry was posted in Iran and tagged Bushehr, light water reactor, nuclear power, technological development. Bookmark the permalink. A great day for all Iranians.